We get many visitors each day in the weaving room. Some are weavers looking for tools and help, some are future weavers beginning the exploration of what it entails, and some are looking to while away the time waiting for their relative or friend to finish the seemingly endless yarn shopping. So, we spend time answering questions, giving tours and demonstrating. This is one of the best parts of my job, because I love to talk weaving whether it is exchanging ideas with a fellow weaver or enticing someone to step down this rabbit hole and embrace weaving themselves. And I understand the curiosity, because looms can be complex machines with lots of parts, and it’s fascinating to see the transformation of a bunch of threads into a beautiful piece of woven cloth. Of course, nothing is more astonishing than when they spy the Toika Eeva and I tell them it is a computer-assist loom. What?! How does that work?! Isn’t that cheating?! Even experienced weavers can have their minds boggled, so I’ll try to explain how these looms work. Let’s start by clarifying that these are computer-assist looms, not computerized looms. What that means is that the computer assists by lifting the shafts – and that’s all! The weaver still does everything else – warps the loom, throws the shuttle, beats the cloth, advances the warp. On a manual loom the weaver steps on the treadles to raise (or lower) the shafts and open a shed. 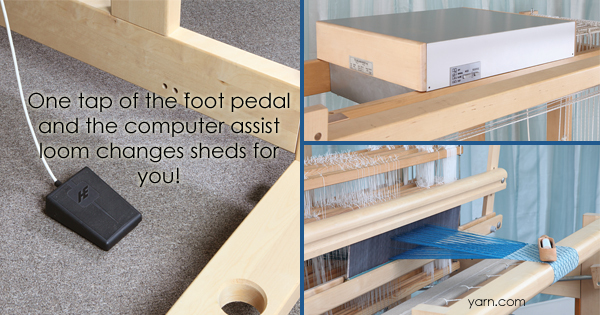 The Toika has a single pedal that is connected to a box that sits on top of the loom and is attached to all the shafts. A computer with weaving software is connected to the box and when the pedal is pushed the box lifts the appropriate shafts for the draft. Each step on the pedal advances the shafts to the next pick. The advantages of this are many. For starters it allows weavers to be free of the physical challenges of lifting shafts with their legs. Many people have issues with hips or knees that make it difficult to treadle a manual loom and a computer-assist loom makes it possible for them to continue weaving. Plus, you don’t have to crawl under the loom to tie up the shafts! Then there is the matter of keeping track of larger numbers of shafts. For those who like to weave complex patterns that require 8+ shafts, threading the loom can be daunting as you try to keep track of which shaft is which. One of my favorite things about this loom is that you can have it treadle the threading. What that means is that it will lift the shafts one at a time in the order they are meant to be threaded, all you have to do is grab the heddle and thread it and move on to the next thread. This saves me hours of threading time, trying to make sure I’m on the correct shaft, and threading errors are nearly nonexistent. And then there’s the other mental task that frequently trips me up – tracking my treadling. I’ve become skilled with long treadling sequences, but it’s liberating to not have to worry about it with this loom. I can shift my focus to my beat and the process and throwing the shuttle. It’s not like I weave on autopilot – I do watch the cloth to see the pattern develop – but I can relax more and enjoy the rhythm. 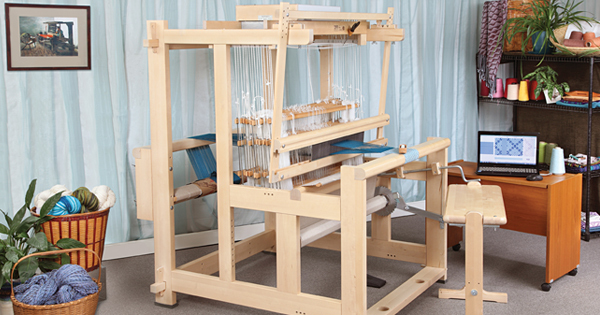 And we have some great news for those who may be thinking about getting a computer-assist loom – we will have one set up at the New England Weaver’s Seminar July 9 – 12, 2015 and we will be pre-selling the floor model at a 15% discount. It’s a great opportunity to save a significant amount and expand your weaving horizons. We are offering the deal on a first come, first served basis, with a deadline of April 15. You can choose either an Eeva or a Liisa, from 40″ – 59″ and 16 – 32 shafts. The loom will come with all the usual accessories (software, bench, reed, heddles, etc) plus you can add any extras like second back beam, sectional beam, etc. for the same 15% discount. We set up the loom with a warp and display it for 4 days and then help the lucky buyer take it down and load it up at the end of the conference. For any questions or to place an order contact us at labestor@yarn.com or barbara.elkins@yarn.com. I’m excited to see who takes home this treasure.